We start our day with a twenty minute hike through the hills of the Shomron, with gorgeous views of the surrounding mountains, scenery that still looks almost the way it looked in Biblical times. We pass hundreds of archeological ruins, from a range of periods, some as old as 3000 years ago. The hills are riddled with caves, large and small, some of which have served as shelters for over 5000 years, as evidenced by the pottery shards and other archeological finds. 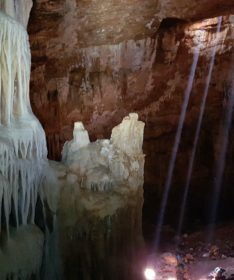 From there we go spelunking (caving) in Haritun Cave, the longest and largest limestone cave in Israel (3,450 square meters, which is over 37,000 square feet! ), with four main levels, at least 55 “halls” and over 4 ½ kilometers (2¾ miles) of tunnels! We will explore this vast network of underground wonder with headlamps to penetrate the pitch black darkness, crawling and climbing through nature and history. On our hike back we will stop at a huge underground reservoir full of deep, cold water, originally built by the Romans to collect rainwater, rebuilt and repaired many times over the centuries. To enter the reservoir you have to climb through a small opening and down a ladder into a mysterious pool illuminated by sunlight filtering through holes in the roof of the chamber creating a magical and unique environment.